Making, selling and perfecting honey in the Inland Northwest. "We did more than 80 gift baskets at Christmas,” says Virginia Wilkerson, the store manager of Hayden, Idaho’s Bee Hive, a retail outlet for all things honey and bee-related. That number is impressive, but perhaps more impressive is the quantity of bees behind the scenes. Mostly, the Bee Hive sells honey. They do so by the pint ($10), quart ($15), five-pound ($22.50), one-gallon ($37.50) and even five-gallon containers ($135). That one-gallon container? That’s the work of thousands of bees, something that isn’t lost on the growing number of beekeepers in the region. All of the Bee Hive’s honey is produced and bottled in North Idaho by bees foraging on local crops like blueberry, mountain berry and clover. Knapweed honey is their biggest seller, says Wilkerson, who encourages visitors to sample a spoonful from bee-shaped squeeze bottles. While Virginia runs the front end, her husband, Bob, helps storeowner Charles Williams with the supply end: the bees. How many bees? Let’s do some math. 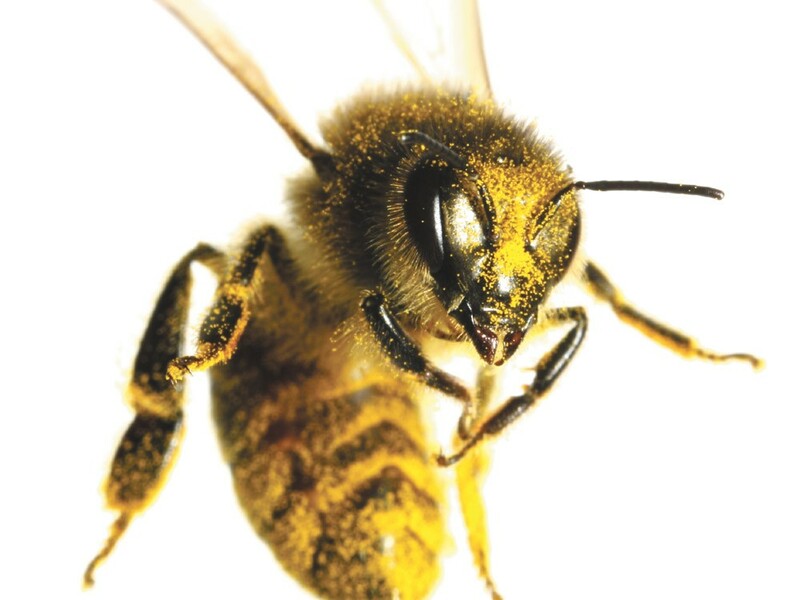 A Western female “worker” bee (Latin name apis mellifera) produces 1/12th of a teaspoon of honey in its six-week lifespan (male drones and queens live longer but don’t produce honey, which is nectar converted to feed hungry bee babies). One pound of honey requires 10,000 bees foraging on about two million flowers. A typical hive contains around 50-60,000 bees, so that’s about five to six pounds of honey under the best of circumstances. Unfortunately, circumstances for bees aren’t the best. Pesticides, loss of habitat and disease have led to increasing concerns over the world’s declining bee population. Because bees serve a two-fold purpose in food production, this is a big deal. In the United States, bees pollinate $15 billion in commercial crops — almonds, avocado, melons, cucumber, alfalfa — and produce $150 million in honey annually. Although wasps, butterflies and flies pollinate (as do bats and birds), bees are a key link in the food chain. Half of the USDA-estimated 3 million honey-producing hives must be brought in, for example, to pollinate southern California’s $2.3 billion-annual almond crops, according to the council. While that adds cost for growers, it provides revenue for beekeepers. On the other hand, the bees might suffer from transport stress and risk exposure to diseases. This transitory process is a fact of life, however, for largerscale operations like the one owned by Williams, who tends to about 4,000 hives. The bees winter throughout the Southwest, including in almond country. In May, Williams brings about 1,000 hives home to southern Bonner and northern Kootenai counties for the summer. Although the Bee Hive teaches classes and plans to sell beekeeping products, its sales are limited to the storefront, website and — indirectly — another passionate endeavor for the Bee Hive’s owner. Williams founded the 56-acre Wilderness Ranch Ministries in Spirit Lake, which he co-owns with his son, Larry, and friend, Clyde, and which is funded through their large apiary. It’s a reminder, they say, that the food we eat is more than merely its chemical composition: it’s part of our culture, our history, even our faith. When huckleberries bloom, the Bee Hive will separately bottle the resulting honey, a process only possible with bees isolated to a concentrated food source, more or less guaranteeing the nectar and pollen they bring to the hive flavors the honey. “Sample [honey] like you would good wine,” advises Linda Carney, president of Inland Empire Beekeepers Association, who keeps between two and eight hives during a given season. Typical U.S. supermarket honey, she says, is likely clover but could be homogenized from unverifiable sources — even thinned or packed with additives. Increasing concerns about imported honey, particularly from China, have led to more stringent testing and regulations on both the federal and state level. In fact, Idaho recently passed House Bill 513, banning the “adulteration” of honey. Carney is just one of the nation’s many beekeeping hobbyists who keeps fewer than 25 hives and she advocates for education and enthusiastically promotes the many benefits of bees. Much to her surprise, she says, having bees resurrected not only cherry, plum and apple trees on her South Hill property, but revitalized neighboring gardens, too. The IEBA’s 120-300 members pay $5 annual dues ($10 for a whole family) to learn about bees, even becoming certified. Many of their members — like Tate’s Honey Farm or Miller’s Homestead — sell honey in small quantities through IEBA’s website, at farmers markets or even local grocers.